You must be a global administrator or security administrator to perform the following task. To learn more, see Permissions in the Office 365 Security & Compliance Center. In order for Office 365 Cloud App Security to work correct, audit logging must be turned on for your Office 365 environment. For more information, see Turn Office 365 audit log search on or off. Go to Alerts > Manage advanced alerts. Select Turn on Office 365 Cloud App Security. Choose Go to Office 365 Cloud App Security. This takes you to the Office 365 Cloud App Security portal, where you can view reports and create or edit your policies. After you have turned on Office 365 Cloud App Security, you can go to the Cloud App Security portal by visiting https://portal.cloudappsecurity.com and signing in. 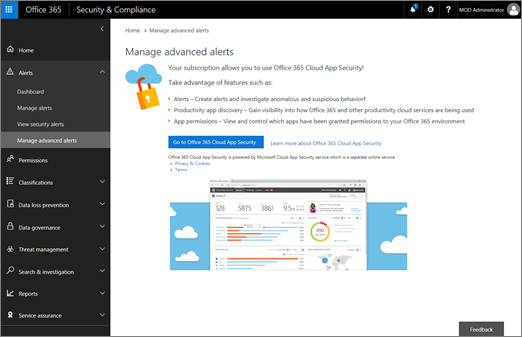 When you turn on Office 365 Cloud App Security, auditing information about your Office 365 user accounts and user activities is transferred to Microsoft Cloud App Security. This allows Office 365 to provide advanced alerts, filtering, and other features so you can get information and take action about suspicious activities.